When it comes to combat sports, the question whether martial arts or boxing will raise an athlete’s physical and mental fitness level best has been subject to many discussions. Especially now that boxing training is being offered more and more in Boxing Clubs Sydney, the old sport has overcome its dodgy reputation and gained wide acceptance amongst fitness fanatics. There no simple answer to the question whether martial arts win over boxing, let’s just say no matter what kind of combat sports you choose, anybody who is trained to punch is going to be a tough opponent in the ring and maybe even on the street. Punches are the cornerstone of competitive fighting but can be very different in styles when it comes to martial arts and boxing. Whereas traditional martial arts such as Karate and Kung Fu use a large variety of different punches, in boxing the moves are more standardised with only a little array of punches and jabs which aim for the head and body of the opponent. 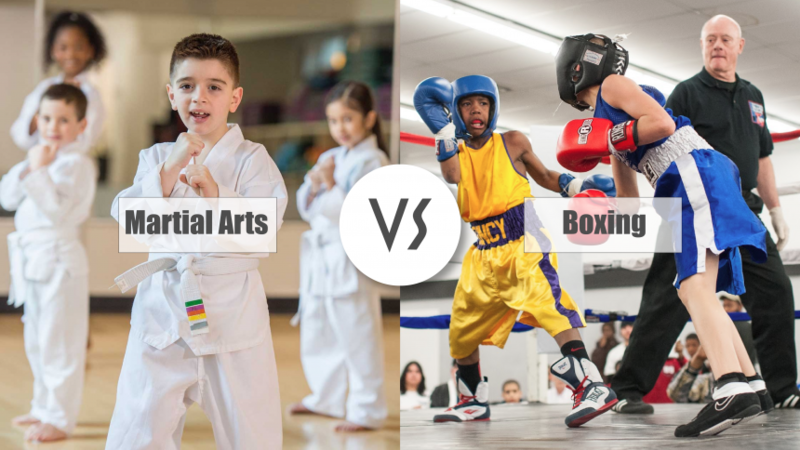 IN boxing, the hands will keep guard around the head whereas the Karateka will pull the punching hand back again and Kickboxers will also use their feet and knees for kicks. The use of gloves in boxing is also different as in martial arts athletes basically fight bare knuckle and will hold their hands lower than boxers in expectations of a lower kick or punch below the belt. A boxing punch is set out to damage in a certain period of time and the force of the jab needs to be severe as gloves will spread the blow to a wide area on the body hence the boxer needs to hit harder to make an impact. As Karate is a self-defence sport it is more about protecting themselves in the fight leaving the athlete with more conservative and focused moves. Boxing was developed to be a fighting sport with two opponents and one referee in the ring, who will only enter when both are well prepared, are in the same weight category and usually obtained the same level of training. Although martial arts have now a similar approach, they were originally designed for self-defence, meaning surprise attacks and strikes are part of the fight. It is therefore possible, that the average boxer will beat the ordinary martial art athlete as boxing is about fighting and to out-punch the opponent and not about routines and meditation that enables the person to break a board as these are common practices in martial arts. When it comes to fitness training, there is always the question which one is better, MMA or boxing. There cant be a right answer to that, more so one should ask for what kind of athlete and what purposes. Boxing training is a great way to burn body fat, as it increases total body strength and power and will build muscles in various body parts in order to develop speed and power in punches. The high-intensity training will also teach you discipline, great footwork, punching combinations, coordination, balance and endurance. If you want to learn the right way how to throw a punch, there’s bound to be a boxing club in your neighbourhood that teaches you all about this old method of fighting. If you’re new to martial arts maybe take some private lessons and learn all about the ancient methods of self-defence. Whether you want to improve your overall fitness, shed some weight or get to know a brilliant sport, when taking up martial arts training you will benefit from improved balance and coordination, a dynamic flexibility of joints and especially power as you will learn how to make explosive movements and jumps you need for punching and kicking. Just like boxing, martial arts are all about mental and physical strength and will bring all fighting styles together. The training also includes boxing but furthermore consists of cardio workouts like swimming, rope skipping and running which makes it an excellent high-intensity workout you will benefit from both physically and mentally.